For 225 months there was no warming to speak of, then in February the latest giant El Nino kicked in and the world went mad. Jo Nova describes it wickedly well: “one Hot Month is the signal and years of The Pause is just noise.” She points out that in 18 years climate models got one month right. Hah! Many alarms being sounded, guilt piling up on western nations for their wicked productivity and climate science distorted beyond belief. Josef Loschmidt (Maxwell’s teacher) was the first to realistically determine the size of air molecules – quite a feat in the 19th century. There is no correct peer-reviewed published refutation of his gravito-thermal effect, which is based on and derived directly from the Second Law of Thermodynamics, that law also never proven incorrect. There’s a US $7,500 reward offered at https://itsnotco2.wordpress.com if you or any reader can prove me wrong and produce a study confirming water vapor warms to the extent implied by the IPCC. Furthermore, the Loschmidt effect is now proven empirically in hundreds of 21st century experiments. The existence of this gravitationally induced temperature gradient means the IPCC doesn’t have a leg to stand on regarding CO2. Hence there is no need for James Hansen’s guesswork that radiation from a cold atmosphere must be heating an already-warmer surface, because it is the force of gravity acting on molecules between collisions that produces both a density gradient and a temperature gradient. The Second Law of Thermodynamics tells us that in Nature there is an autonomous propensity for a system to move towards the state of thermodynamic equilibrium, which state has maximum entropy. However, this state in a force field is NOT isothermal. That is, there exists a non-zero temperature gradient which we can understand and quantify using the Kinetic Theory of Gases. This fact, known about by physicists since the 19th century, completely demolishes the greenhouse. Hansen assumed isothermal conditions without GH gases, but that is NOT what the Second Law of Thermodynamics indicates will tend to occur. See http://climate-change-theory.com for more detail. In the state of thermodynamic equilibrium (that is, maximum entropy) in a column of the troposphere the pressure from above and below any horizontal plane is equal. Because pressure is proportional to the product of temperature and density, and because there can be no transfer of energy or matter across any internal boundary when there is thermodynamic equilibrium, we can deduce that, for any horizontal plane, there must be equal numbers of molecules crossing upwards as there are crossing downwards, and the mean kinetic energy of each group while crossing the plane must be equal. Now for the temperatures to be equal when crossing this means that (because molecules gain Kinetic Energy with downward motion) there must have been lower mean molecular Kinetic Energy (temperature) above the plane and warmer temperature below. Hence there is a stable equilibrium temperature gradient resulting from the entropy maximization process described in statements of the Second Law of Thermodynamics. Do we have any physicists who can support or refute these points? Assuming that “Lukes” is Doug Cotton, then this discussion is likely to be one way. One exceptional month (a spike) in the Northern Hemisphere means “global” and “warming”. They (Schmidt, Rahmstorf, Sherwood, Foster et al) will look silly when the heat dissipates to space, as it normally does i.e. neutral conditions resume once the El Nino has passed. ENSO-neutral GMST is critical to the man-made climate change conjecture from 2015 – 2020. The conjecture is already falsified by the IPCC’s primary TOA criteria, next comes secondary surface temperature which TOA energy imbalnce “controls” (IPCC). If there’s no radical ENSO-neutral warming by 2020 then all the CO2-forced forecasts will be way out of the model range and demonstrably wrong, along with the conjecture. What were the factors in the NH? >”If there’s no radical ENSO-neutral warming by 2020 then [observations] will be way out of [all the CO2-forced forecast] model range and demonstrably wrong, along with the conjecture. Hence the Greenhouse radiative forcing conjecture is FALSE. So carbon dioxide cannot warm the surface. But that leaves us then with no explanation for the surface temperature of Earth, let alone Venus, because the solar radiation reaching these surfaces is far too little to explain observed temperatures. Hence it is NOT radiation that is supplying the necessary thermal energy. Instead, the solution to the dilemma is found in a correct understanding of the process described in statements of the Second Law of Thermodynamics, namely maximum entropy production by the dissipation of unbalanced energy potentials. When, perhaps on a calm night just before dawn, we have a state that is close to maximum entropy, there is observed a non-zero temperature gradient. That is because, for there to be no unbalanced energy potentials, the mean sum of molecular (gravitational potential energy + kinetic energy) must be homogeneous. Hence there is a temperature gradient derived by equating d(KE)=-d(PE) so that m.cp.dT=m.g.dH (where cp is specific heat) and thus the gradient dT/dH=-g/cp. This is then reduced in magnitude by the temperature leveling effect of intermolecular radiation between GH gases, which thus cause the plot of temperature against altitude to rotate downwards at the surface end, cooling the surface. Finally, the way the required thermal energy gets into the surface from where it is absorbed from solar radiation in the troposphere and ozone layers is by the process of maximum entropy production that is repairing the temperature gradient and raising the whole plot of temperature against altitude to a higher but parallel position. It thus intersects the surface at a higher temperature and you just need to come to grips with the fact that the old Clausius (hot to cold) corollary of the Second Law only always applies in a horizontal plane. In a force field, as also seen in a vortex tube, there CAN be heat from cold to hot. For more detail see http://climate-change-theory.com . Few people have PhD’s in climatology, so when Dr Hans Jelbring (one who has) strongly supports what I have said I would suggest you ought to heed this new 21st century breakthrough in our understanding of planetary temperatures and heat transfer mechanisms. “Dear all, Including politicians, laymen and scientists. I am strongly supporting what Doug is writing below based on the fact being one of few scientists who actually have a doctorate in climatology. All of you who believe in authority should believe what Doug is saying below which is according to my own research and what some qualified scientists have told since many years. …. Note also the following review of my book ..
Doug Cotton shows how simple thermodynamic physics implies that the gravitational field of a planet will establish a thermal gradient in its atmosphere. The thermal gradient, a basic property of a planet, can be used to determine the temperatures of its atmosphere, surface and sub-surface regions. The interesting concept of “heat creep” applied to diagrams of the thermal gradient is used to explain the effect of solar radiation on the temperature of a planet. The thermal gradient shows that the observed temperatures of the Earth are determined by natural processes and not by back radiation warming from greenhouse gases. Evidence is presented to show that greenhouse gases cool the Earth and do not warm it. Regarding Roy Spencer’s blog, I consider it a victory for correct physics that he, due to his complete failure to even look into the errors in his pseudo science that I pointed out many times (on his blog and in countless emails to him) and his hand-waving comments brushing aside my many thousands of hours of research, my qualifications and teaching experience in physics over several decades (even getting a scholarship from the Physics Dept of Sydney University) and the overwhelming evidence supporting this 21st century breakthrough in our understanding of planetary core and surface temperatures – despite all this, he imagined a simple IR thermometer disproved Loschmidt, Hansen, Nikolov and Zeller and several others apart from myself when Roy himself doesn’t even know how such instruments actually determine temperatures. Their sensors do NOT get warmed by radiation from a cooler object: instead the instrument measures the rate of cooling of the sensor, because heat is from the sensor to the cooler object, not the other way as climatologists think is possible. For more on radiation see my peer-reviewed paper “Radiated Energy and the Second Law of Thermodynamics” published on several websites in 2012 and linked from the ‘Evidence’ page at http://climate-change-theory.com . The pattern of Arctic weather and ice conditions this  winter is somewhat similar, albeit not as extreme [as 1871]. The Rossby Wave Meridional flow resulted in anomalous wind patterns, ocean currents and ice conditions. It is probable that this added heat raised the global average that was not a result of El Nino. Figure 8 shows the average pattern of Arctic winds and ocean currents. The main influx of warm water is the North Atlantic Drift. Figure 9 shows the percentage concentration of ice for April 2, 2016, and Figure 10 shows the ice cover for April 1, 2016, with a delineation of the anomaly from the average. The increased melting, especially in the Russian sector due to greater heat transport by wind and water from the Meridional Wave pattern is apparent. This heat is not due to El Nino but does add to the global average. Given the spacial location of the latest GMST spike (high NH latitudes) and Tim Ball’s dissertation, I’m now convinced this El Nino was minor in terms of contribution to GMST. Too many people have been suckered by the GMST illusion. Climate scientist’s aiding the suckering include Schmidt, Rahmstorf, Sherwood, and Foster. Mann was suckered by Schmidt and Rahmstorf. Patterns of weather occurring now are precisely what occurs when the world is in a cooling trend, and the global wind patterns change. What we are witnessing is a heat dissipation process – ocean => atmosphere => space, i.e. climate system cooling, NOT an atmospheric warming process. As usual, climate scientists have made a gross miss-attribution. The anomalous atmospheric heat will dissipate to space eventually leaving climate scientists (excepting Tim Ball at least) in a rather cooler world than what they thought they would be in. This is really weird. I’m seeing comments in one browser that I can’t see in another and vice versa. Do you mean here at CCG? OK, let me know if it’s worth our while to let LukesAreWrongToo carry on to his heart’s content or we should cut off his water now. I’m not that happy to let him fill a few megabytes at my expense if we’re not learning from him. Too many people have been suckered by the GMST illusion. Climate scientist aiding the suckering are Schmidt, Rahmstorf, Sherwood, Foster, et al. Mann was suckered by Schmidt and Rahmstorf.</blockquote"
I wasn’t referring to Mann because Mann was just relaying what he had read others saying (see upthread). I was referring to Schmidt, Rahmstorf, Sherwood, Foster et al. Nigel, to his credit, agrees “only time will tell”. Not so Gareth. He accepts what “the world’s leading climate scientists” say as the gospel truth ahead of what actually transpires. Time, and the Kelvin-Planck statement of the Second Law of Thermodynamics (excess heat, whether El Nino or just anomalous Arctic weather, dissipates to a heat sink – space in this case), will be the ultimate arbiter. If there’s no radical ENSO-neutral warming between now and 2020, “the world’s leading climate scientists” will be leaders in a category they would rather not be in. I think Nigel has an inkling of this. The acid test is on AGW now, Busted at TOA, if no radical warming by 2010, busted at surface too. Mann wasn’t speaking his own mind, he was channeling Schmidt et al. Re Schmidt, Rahmstorf, Sherwood, Foster et al. and their attribution of AGW to the 2015/16 GMST spike. Their collective credibility along with the UKMO’s, irrespective of what Gareth Renowden thinks, is wholly reliant on GMST tracking the UKMO forecast (blue zone). Given the UKMO’s annual 5 yr forecasts have been serially wrong year after year in respect to ENSO-neutral observations, the chances of them being right this time are remote (to say the least). The ENSO-neutral trajectory of GMST is along the bottom of the green zone. There’s no reason for this to change radically for about a decade. The difference this El Nino year is the Arctic factor (El Nino contribution minor IMO). But excess Arctic heat dissipates just as excess El Nino heat dissipates. If “heat trapping greenhouse gasses” didn’t trap past El Nino heat (they didn’t), there’s no reason to believe they will trap any heat this time around either, Arctic factor or not. It’s been like 30 degrees and snowing for the past week in the Midwest in the US, so I think that should cancel out the unusually warm February. I mean, if a warm February proves global warming, does snow in April disprove it? I’m not terribly familiar with the rules for this game. The global temperature in March has shattered a century-long record and by the greatest margin yet seen for any month. February was far above the long-term average globally, driven largely by climate change, and was described by scientists as a “shocker” and signalling “a kind of climate emergency”. But data released by the Japan Meteorological Agency (JMA) shows that March was even hotter. Data released released later on Friday by Nasa confirmed last month was the hottest March on record, but the US agency’s data indicated February had seen the biggest margin. The Nasa data recorded March as 1.65C above the average from 1951-1980, while February was 1.71C higher. The NH-only “global” warming spike claimed for AGW/MMCC by Schmidt, Rahmstorf, et al (“shocker” and “a kind of climate emergency”) is dissipating to space in accordance with the Kelvin-Planck statement of the Second Law of Thermodynamics. Hot Topic runs and hides from this. Prof Adam Scaife, at the UK Met Office, said the run of record temperatures was set to continue, but that records would be less likely in 2017 as the impact of El Niño waned. Some sanity, except the UKMO’s 5 yr “decadal” forecast is wrong every year but Scaife is still clinging to the notion that “Global temperatures are expected to continue to rise in future decades due to climate change” nevertheless. But what if ENSO-neutral GMST is back on the 21st century flat trajectory (i.e. back to hiatus) by end of 2016 – early 2017 …….?????? How long will it take for the likes of Scaife to abandon their expectation in the face of reality? In the Southern Extratropics too? GISTEMP has not been at record levels in SH Extratropics over recent years. Just another Wash Post beat up regurgitated by the NZ Herald, and a chance for Schmidt to make asinine statements. B) None of it according to the Kelvin-Planck statement of the Second Law of Thermodynamics (in respect to heat sinks – space in this case). Not looking good for the climate scientists – all that AGW/MMCC attributed “warming” is now “cooling”. Signs indicate we’ve reached the threshold scientists fear, heralding abrupt and irreversible change. If you spend a lot of time talking to scientists about climate change, there’s one word you’ll hear time and time again, and yet it’s hardly ever mentioned in the public discussion of climate change. The word is “non-linear”. Most people think of global warming as an incremental thing. It may be inexorable, but it’s also predictable. Alas, most people are wrong. The climate is a very complex system, and complex systems can change in non-linear ways. In other words, you cannot count on the average global temperature rising steadily but slowly as we pump more and more greenhouse gases into the atmosphere. It may do that – but there may also be a sudden jump in the average global temperature that lands you in a world of hurt. That may be happening now. “We are moving into uncharted territory with frightening speed,” said Michel Jarraud, secretary-general of the World Meteorological Organisation, last November. He was referring to the unprecedented way the warming is now accelerating. The hottest year ever was 2014 – until 2015 beat it by a wide margin; 2016 may beat it by an even wider margin. It was the hottest January ever – and then the average global temperature in February was a full fifth of a degree Celsius higher than January. That was a huge jump, since the “average global temperature” is an average of all the temperatures over the seas and the land in both the summer hemisphere and the winter hemisphere. It is normally a very stable figure, changing no more than a few hundredths of a degree from year to year. But March was not only hotter than February, it was hotter by an even wider margin than February was over January. Indeed, each of the past 11 months has beaten the highest previously recorded average temperature for that month. Some people try to explain this all away by blaming it on El Nino, a periodical rise in the ocean surface temperature in the eastern Pacific that moves the rainfall patterns around worldwide, causing droughts here and floods there. But El Nino is a LOCAL rise in temperature, it does not normally affect the average global temperature much. The frightening acceleration in the warming in the past three months has no precedent in any El Nino year, or indeed in any previous year. It could be some random short-term fluctuation in average global temperature, but coming on top of the record warming of 2014 and 2015 it feels a lot more like part of a trend. Could this be non-linear change, an abrupt and irreversible change? Yes. And if it is, how far will it go before it stabilises again at some higher average global temperature? Nobody knows. Last year the average global temperature hit 1C higher than the pre-industrial average. That is halfway to the plus-two degree level which all the world’s Governments have agreed we must never exceed, but at least we got to plus-one slowly, over a period of two centuries. The plus-two threshold matters because that’s when the warming we have already caused triggers effects we cannot control: the loss of the Arctic sea-ice, the melting of the permafrost, and immense releases of CO2 from the warming oceans. After plus-two, we will no longer be able to stop the warming by ending our own greenhouse gas emissions. Even at the global climate summit in Paris in December, there was still hope we might avoid triggering the effects, because the historic rate of warming would still give us about 25 years to work on cutting our emissions before we reach plus-two. But if the current non-linear surge in warming persists, we could have covered half the remaining distance and reached plus 1.5C by the end of this year. Obviously most scientists will not go this far in public, but they are very worried. Ten years ago I spent almost a year interviewing the world’s leading climate scientists for a book I was writing. I learned all our calculations for dealing with climate change could be swept aside by a non-linear event. This could be it. Baloney. The local event skews the entire global average. This El Nino was NH-only. The SH anomaly at end of April is now only fractionally above the 1981 – 2010 Climatology baseline and about 0.3°C COOLER than October 2015 at the start of the series. Another 0.25°C and the 21st Century “Hiatus” will be back. Another 0.5°C and the anomaly would be at the 1981 – 2010 Climatology baseline (i.e. no warming at all in this climate regime spanning 35+ years). NZ’s warm temperatures at present are not typical of the SH. There is a distinct “lack of warmth in the southern hemisphere” as per NCEP contrary to Simon’s Sarc. The NH anomaly hasn’t moved much yet which skews the global metric. Even so, global T is back where it was in March 2015. The window of (NH-only – see top graph) El Nino opportunity warmies like Simon had open for a few months is not only slamming shut on them but it’s contradicting their narrative in a very embarrassing fashion. There is no concrete evidence linking the powerful El Niño Pacific Ocean warming event to climate change, says leading climate scientist Fredolin Tangang. “El Niño is a naturally occurring phenomenon, which is part of the inter-annual variability associated with oscillation of the atmosphere-ocean interaction in the Pacific Ocean that occurs in a two- to seven-year cycle,” he explained. Poke in the eye for Schmidt, Rahmstorf, Sherwood, Foster, Mann, and the UK Met Office. Leftover warm water in Pacific Ocean fuelled the recent massive El Niño. A similar event occurred in 1990. That year, easterly winds counteracted a budding El Niño, and leftover warm water fuelled El Niño conditions in 1991 to 1992. A new study provides insight into how the current El Niño, one of the strongest on record, formed in the Pacific Ocean. The new research finds easterly winds in the tropical Pacific Ocean stalled a potential El Niño in 2014 and left a swath of warm water in the central Pacific. The presence of that warm water stacked the deck for a monster El Niño to occur in 2015, according to the study’s authors. Following strong westerly wind bursts in boreal winter and spring of 2014, both the scientific community and the popular press were abuzz with the possibility of a major El Niño developing. However, during the boreal summer of 2014, the Bjerknes feedback failed to kick in, aided and abetted by a strong easterly wind burst. The widely anticipated major 2014-5 El Niño event failed to materialize and even failed to qualify as an El Niño by conventional definitions. However, the boreal summer easterly wind burst had the effect of not only inhibiting the growth of the El Niño event, but also preventing and then reversing the discharge of the equatorial heat content that typically occurs during the course of an El Niño event. This head start of equatorial heat content helped push the 2015-6 El Niño event to extreme magnitude. Totally demolishes Schmidt, Rahmstorf, Sherwood, Foster, Mann, and the UK Met Office. Global atmospheric temperatures as measured by satellite instruments and analysed by UAH made April 2016 the fourth warmest month in the satellite temperature record, but only the second warmest April behind April 1998. Global atmospheric temperatures in April 2016 as measured by satellite instruments and analysed by RSS shows that it was the second warmest April and fourth warmest month since satellite monitoring began. Not much for the warmies to crow about from now on. Even ending at the peak El Nino data the RSS TLT trend is only 0.130 K/decade. It’ll be back to “Hiatus” by the end of the year i.e. an even lessor linear trend over the entire RSS series and flat this century. Written by Thomas Richard, Examiner.com on 09 May 2016. The IPCC’s former vice chair told Malaysian news outlets today that while the naturally occurring El Niño of 2015-2016 was very powerful, global warming did not play a role. Dr. Fredolin Tangang of the University of Malaysia/Kebangsaan also said that even though this El Niño was one of the strongest recorded since recordkeeping began, there was no evidence that global warming was causing El Niños to become more frequent or more intense. An oceanographer and climatologist, Prof. Tangang served on the United Nations’ Intergovernmental Panel on Climate Change (IPCC) as its vice-chairman from 2008 to 2015. Written by Dr. Benny Peiser, GWPF, guest post on 09 May 2016. Completely contrary to Schmidt, Rahmstorf, Sherwood and Foster who claimed almost all of the El Nino spike for AGW/MMCC. As usual, there is no logical inconsistency between these statements except within your own mind. anomaly. Here is a nice little animation to mull over. I get 404 Not Found when I click on Simon’s link. and how this is the thing to communicate, not surface temps. Why don’t we communicate that, and did you notice that there are no numbers in Hawkin’s page? 1) Your own personnal assessment Simon? 2) Contrary to ex-IPCC vice-chairman. Climatologist and oceanographer Prof Dr Fredolin Tangan (“no concrete evidence”). 3) How EXACTLY does AGW increase an anomalous very short-term spike Simon, if as Tangan puts it there is “no concrete evidence” of this? 4) Schmidt, Rahmstorf, Sherwood, Foster, Mann et al, are claiming MOST of the El Nino spike for AGW – NOT just an “increase”. Problematic because “heat trapping GHGs” are NOT “trapping” the heat (i.e. the AGW conjecture is falsified). The anomaly will return to ENSO-neutral (as 1998 did) in accordace with the Kelvin-Planck statement of the Second Law of Thermodynamics and contrary to the above climate scientists (excspt Tangan). Given 1 – 4, the logical inconsistency appears to be in your mind Simon. Good find. Guest post by Matt Palmer and Doug McNeall (UK Met Office), no less. There seems to be considerable reticence by the IPCC and likes of UKMO to address the actual TOA data vs theoretical figures – why one wonders? Except the actual data is trendless this century and 1/3 of the theoretical CO2 figure and less than a 1/4 of the net theoretical anthro figure i.e. the man-made climate change conjecture is busted. Well yes (duh), the troposphere is only a bit player and a sea => space energy transfer medium that obviously exhibits higher temperature if there’s more energy in transit, so why the fuss about GMST? And given the sun (including solar change at TOA and/or surface) heats the ocean predominantly in the tropics and CO2 has no part (despite IPCC speculation), thermal solar-temp lag time is in the order of “10 – 100 years” (Trenberth), man-made climate change theory is irrelevant to “the dominant term in Earth’s energy budget”. Palmer and McNeal only allude to some vague GHG – EEI connection (as does the IPCC). But when the AO physics is investigated in detail, there IS NO connection. Eventually climate science will collective wakeup to this, but it will take time when they have no self-imposed or professionally regulated accountability (think professional civil/structural engineers or the medical profession for example). And contrary to Levine and McPhaden (2016). Something significant is occurring in the Atlantic Ocean, according to meteorologist Paul Dorian of US weather forecast service Vencore Weather – Atlantic cooling. Evidence is growing to support predictions that the Atlantic Ocean is in a cooling phase and is set to cool further over coming decades with weather impacts for northern Europe and the north western US. Dorian is not the first scientist to reach this conclusion and he has put his thoughts into this article which was posted on the Vencore Weather website. by Paul Dorian, Meteorologist, Vencore, Inc. In addition to solar cycles, temperature cycles in the planet’s oceans play critical roles in our ever changing climate and also on the extent of global sea ice. Oceanic temperature cycles are often quite long-lasting and a warm or cold phase can persist for two or three decades at a time. In general, the Atlantic Ocean experienced a cold phase from the early 1960’s to the mid 1990’s at which time it flipped to a warm phase and that has continued for the most part ever since. The current warm phase; however, is now showing signs of a possible long-term shift back to colder-than-normal sea surface temperatures (SST) and this could have serious implications on US climate and sea ice areal extent in the Northern Hemisphere. Even more serious implications for the man-made “warming” conjecture. Ah yes, the global “average” illusion using HadCRUT4. Perfect illustration of the “global average illusion”. 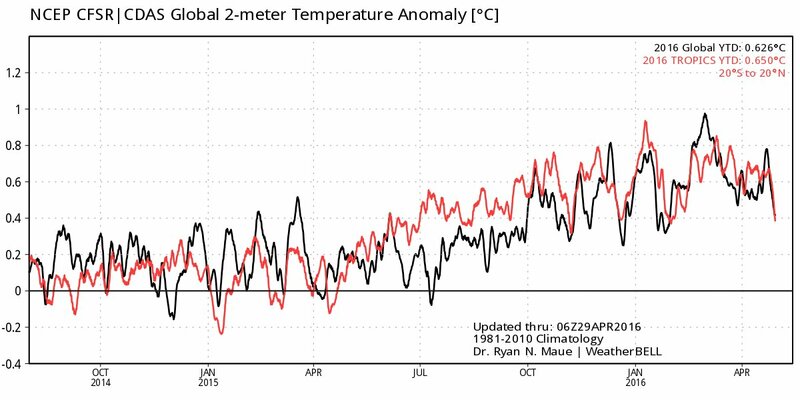 The “global” anomaly (+1.11 C) is totally meaningless in this context (see 75S anomaly). Also, the spike is “sharply down” i.e. Schmidt’s starting to look like the dunce he will be by the end of the year. According to the NOAA, April 2016 was ranked 24th warmest out of 122 in terms of Maximum. Did you know 1946 was the 2nd warmest April? I’ve highlighted the March 1878 anomaly in Figure 1. Watching the animation on the first pass, I waited and waited and waited some more for those February, March and April 1878 values to be exceeded. And I was still waiting more than 100 years later on the animation. See Figure 2. As shown in Figure 3, it wasn’t until 1990 that the March and April 1878 values were surpassed. Did Ed Hawkins really want to draw everyone’s attention to that curiosity? HadCRUT4. But GISTEMP only commences 1880……..
Now that global temperature has skyrocketed, talk about a “pause” of global warming only embarrasses the deniers who so craved it. Hence they’ve switched — again. Their general strategy is to search long enough and hard enough to find one thing that looks like it’s a sign against warming, which is easy even in a warming world; random fluctuation alone ensures there’s always at least one thing that’s bucking the trend. Temporarily, that is; because global warming is real, those fluctuation-induced signs don’t last. When the one deniers have been crowing about (like the so-called “pause”) turns out not to be, they switch to a different talking point. Would this be the so-called “pause” that Mann et al recently wrote a paper in Nature about? Heh. But only in the Northern Hemisphere, in pockets, due to a naturally occurring fluctuation. Grant Foster will be running for cover by the end of the year. Frantically cobbling up another linear “long-term” trend. Model Version 3.0. Still, the guy is good for a laugh. Gee Grant, isn’t that what Carl Mears of RSS said, using the same word “clearly”, should be done but with 5 yr smoothing rather than 1 yr to eliminate the noise you’re frothing over? And exactly what John Christy of UAH did? But hell will freeze over before we se that in a Tamino post. Global average surface temperatures for the first four months of this year show that 2016 is shaping up to be the hottest year in the temperature records maintained by NOAA which date back to 1880. Land and ocean temperature departure from average (with respect to the 1981-2010 base period. Data source: GHCN-M version 3.3.0 & ERSST version 4.0.0. Courtesy: NOAA. However, while the data from both NOAA and NASA unequivocally suggest that April 2016 was the warmest April on record and, certainly, warmer than April 1998, other data suggests that this is not necessarily the case. One look at the spacial distribution (see map linked above) reveals the “global average” to be totally meaningless. The skew is still concentrated in Russia. All this will chnge with a La Nina. Catastrophic climate change is 100% certain. No room for any dissent in Portland. July 1st, 2016 by Roy W. Spencer, Ph. D.
With the rapid cooling now occurring in the global average tropospheric temperature, my previous prediction of a record warm year in the satellite data for 2016 looks…well…premature. Basically, as long as the anomalies stay below the June value of 0.34 deg. C, 2016 won’t be a record warm year. If only I had kept my mouth shut nine days ago….